Adults, children, and infants have different needs when it comes to CPR. Children’s physiologies, bone structures and makeup, and the types of dangers they face are different than adults; so the techniques you use on an adult could cause more harm than good if you use them on children or infants. Here’s an overview of the differences between adult, child, and infant CPR. Call 911. When performing CPR on an adult, you should call CPR immediately before beginning if you are the only person present—unless you believe the person is unconscious because of a blocked airway; in which case you should call 911 after providing CPR for a minute. If there are others nearby, someone else should call 911 while you begin. Check for a pulse. It’s usually easiest to find the pulse on an adult by checking the carotid artery on the neck, just below the jaw, with two fingers. Provide rescue breaths. Hands-only CPR is currently recommended by the American Heart Association, particularly for people who are not experienced in delivering CPR. 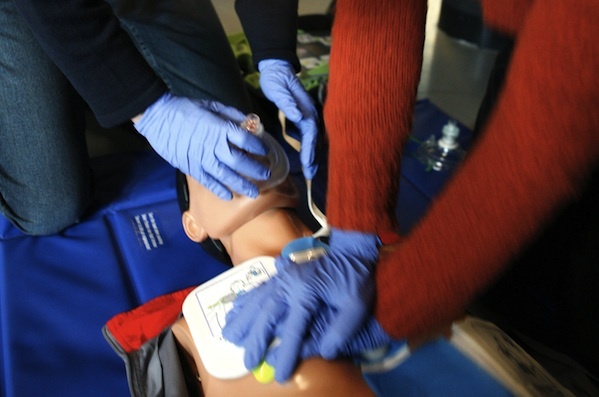 But if you do provide rescue breaths to an adult, you’ll tilt the victim’s head back slightly and clear the airway with a finger before breathing. Provide compression. For an adult, you’ll provide compressions with two hands in the center of the chest, putting pressure through the heels of your hands. The depth of compression for adults should be approximately two inches. Generally, children’s bones are more flexible than adults’; a young child’s bones are more likely to bend where an adult’s would break. Their tongues are larger in proportion to their mouths as well, and their airways are narrower. Because of these characteristics—and the habit young children have of putting foreign objects in their mouths—children are more likely than adults to need CPR as a result of a blocked airway. Most of the techniques used for children aged one to eight years old are the same as those recommended for adults. Here’s an overview of the places where there are differences. Start CPR before calling 911. Most experts will tell you to start CPR immediately on a child if you are the only person present and you have to make a choice between beginning CPR and calling emergency response. This is because children are generally more resilient than adults, and their chances of survival if they receive immediate CPR are much higher—approximately 70%. If alone, you should call 911 after providing CPR to a child after five compression and breath cycles, which should last about two minutes. Of course, if there are other people around, someone else should call 911 immediately as you perform CPR. Provide rescue breaths. Children’s airways are more fragile than adults’. As a result, you must be more careful when providing rescue breaths to a child not to tilt the head back too far. This can actually block the airway further, especially for smaller children. So be careful in tilting the head back, and breathe more gently with a child than you would with an adult. Provide compressions. Depending on the size of the child, you can use one or two hands to provide compressions. Because children have smaller chests than adults, the depth of compressions should be only one and a half inches. The compression and breath rate should be the same for children as for adults—30 compressions to two breaths. AED treatment. If you have access to an AED, you should use it after five cycles or about two minutes of CPR. Use the pediatric pads if they are available. Infants are even more fragile than children, and care should be taken when providing CPR. As with young children, infants’ bones are more flexible than adults’, but also more delicate. Checking to see if the baby is unconscious. Before you begin CPR on a child or adult, you will be trained to tap the victim’s shoulder or shake the victim to determine consciousness. For a baby, shaking is not advised. Instead, gently stroke the baby, or tap the soles of the feet, and watch for movement or another response. Perform CPR before calling 911. As with small children, infants have a higher survival rate than adults when receiving immediate CPR. If you are alone, provide CPR first—and then call 911 after five CPR cycles or two minutes. If there is anyone else present, have that person call 911 while you provide CPR. Check for a pulse. The place where you check for a pulse in infants is different than for children and adults. Instead of using the carotid artery, check for a pulse on the inside of the upper arm, where the brachial artery is found. Provide rescue breaths. Infants have very fragile airways that become blocked easily. Tilting the head back too far can make the problem worse. The correct position for infants is called the “sniffer’s position”—which entails tilting the head back just enough to make the baby appear to be sniffing the air. When providing rescue breaths, be very gentle. Use your cheeks rather than the full strength of your lungs to expel the air into the baby’s mouth. Because babies’ faces are so small, you can cover their entire mouth and nose rather than just their mouth when providing rescue breaths. Provide compressions. 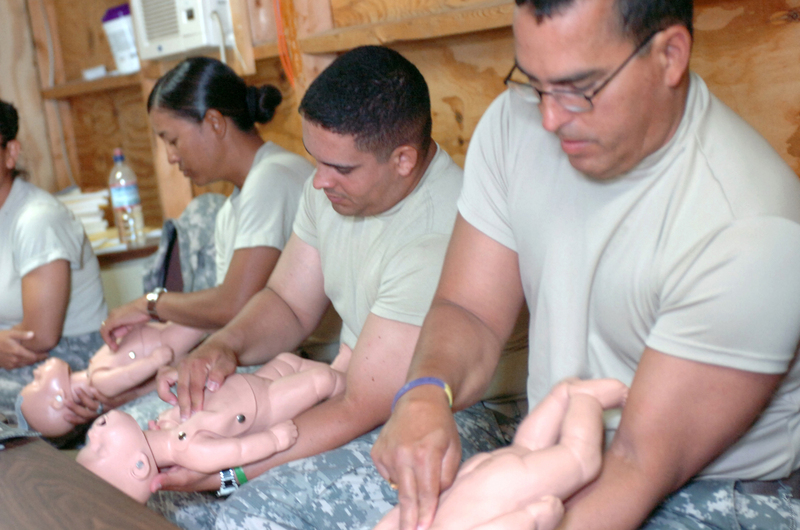 Because they are so small, babies only require two fingers in the center of the chest during chest compressions. Compressions for infants should only be an inch to an inch and a half deep. Frequency should be 30 compressions to two rescue breaths. Children have higher survival rates after receiving immediate CPR than adults do—primarily because they are so resilient, but also because they are more likely to need CPR because of an airway blockage rather than a cardiac arrest. Because of this, it is especially imperative that children receive lifesaving CPR immediately—from a bystander if no medical professionals are in the immediate area. By learning child and infant CPR, you could potentially save a life.